Obstruction of common corridors is the biggest issue that prevented Town Councils from receiving a ‘green’ banding in the annual Town Council Management Report released on 4 November 2014. Blocked corridors are the biggest obstacle when it comes to estate maintenance, and town councils remain hapless in solving the problem. Unlike the condition of railings or electrical fittings, it is residents rather than town councils that are responsible. And too many of the residents are used to occupying common areas with flowerpots and shoe cabinets, for example, said council chairmen. “It’s quite a tough problem to solve,” said Jurong Town Council chairman David Ong. The issue was flagged in the annual Town Council Management Report released on Tuesday, highlighting obstruction of common areas as the biggest problem. It accounts for 32 per cent of all estate maintenance issues – the category which tripped up most of the estates. Eleven out of 16 of them scored only “amber”, a medium rating, in estate maintenance. In contrast, all 16 scored “green”, the best rating, in other areas like estate cleanliness and lift performance. The longstanding bugbear could be partly due to ignorance, said Mr Ong. Not many are aware of the Singapore Civil Defence Force guidelines requiring a clear space, at least 1.2m wide, to be maintained along corridors. Town councils’ soft approaches could be a factor too. Most prefer persuasion to enforcement. “We try to talk to the residents first and advise them to remove it,” said Mr Ong. Town councils that achieved a green banding said co-operation, more than enforcement, was the key to success. His town council puts up posters to raise awareness and recently launched a campaign for gracious neighbourly behaviour. Enforcement is a last resort. Ang Mo Kio Town Council’s outreach efforts include daily inspections where residents are advised on the storage of items, said chairman Lam Pin Min. There are also mass cleaning exercises to help clear unwanted and bulky items along corridors. Sembawang Town Council chairman Hawazi Daipi attributes his town council’s green rating to helpful feedback combined with thorough inspections and swift action. For Tanjong Pagar Town Council chairman Lily Neo, reaching out to residents who have hoarding issues is also key. But ultimately, it is up to residents to keep common areas clear. Housewife May Goh, 52, is one who makes sure to leave adequate space along the corridor. “These are kept very neatly,” she said in Mandarin, gesturing to the shelf of potted plants next to her unit. Reported that the cleaners frequently saw and hammer wood at a Chua Chu Kang rubbish collection point, causing noise disturbance to the residents. Residents wrote in to the MP and hopes that the authority can solve the problem. Mr Wang, 73 years old, staying at Chua Chu Kang Ave 1 Blk 237 told Shinmin Ribao that he is affected by the noise at the rubbish collection point. Together with other residents, he wrote in to the MP to feedback. This reporter saw 2 cleaners at the rubbish collection point sawing the disposed furniture into smaller pieces and putting them into the collection box. These cleaners will usually clear and dismantle the old furniture during 2pm to 5pm. Mdm Wu, 56 year old, mentioned that the noise is worse at the higher floor due to the echo. She will turn on the air con, close the windows and door in the afternoon when the cleaners are dismantling the furniture. The missing incense burners were actually taken by the Town Council for maintenance and they have already been placed back at the original locations yesterday morning. As reported yesterday, a resident staying at Jurong West Street 71 Block 718 realized that the 3-4 new stainless steel incense burners around his estate were missing and suspected that they were stolen. When the reporter visited the estate two days ago, only the older brown incense burners were left. The new incense burners are placed back at the original locations when the reporter visited the estate yesterday afternoon. Chua Chu Kang Town Council mentioned that the new incense burners were not stolen and were taken away for maintenance. Town Council have already placed the new incense burners back yesterday morning. Reported that the new stainless steel incense burners at Jurong West were stolen. The incense burners were provided by the Town Council for residents during the 7th month. Jurong West Street 71 Block 718 resident, Mr Chai mentioned that 3-4 new incense burners were missing. Town Council have placed several old and new incense burners at the estate, the old ones are brown in colour while the new ones are shiny silver. The new incense burners look pretty but Mr Chai found them missing yesterday. He thought that only the new incense burner under his block was missing, but after walking around the estate, he realized all the new incense burners in the estate were missing. The reporter saw that only the old brown incense burners were left and the new ones were missing. Town Council have placed a metal pole beside the new incense burner to chain the incense burner to the pole to prevent people from removing it. However, it seems like they have not been able to chain the incense burners in time. Mr Chai mentioned that the market is bad and the new stainless steel incense burners are worth much more than the old incense burners. He will have to use the old incense burners now. Another resident mentioned that the incense burners were provided by Town Council for the residents and the thief should not steal them away. The incense burners are big and will require two people to steal them and they will also need a lorry. Media Report: Kudos: Town Council staff carry Choa Chu Kang resident who had difficulty walking – all the way up 10 storeys. Two Town Council staff members came to the aid of a Choa Chu Kang resident, who has walking difficulties, when a power outage caused the lifts to be out of order at the block last week. According to an article in Omy.sg, the two staff members went beyond their call of duty and took turns carrying the 70kg resident up ten storeys, to his unit. The incident reportedly took place at Block 682, and the power outage was from 8am until 5.30pm that day. When the lifts at one of the flats in Choa Chu Kang could not be used due to an electricity outage last Wednesday, Choa Chu Kang Town Council officers came down to help the affected residents. Two of the officers, Mr Nur Farizzat Zainal Abidin and Mr Joseph Lee, both aged 27, carried a man aged roughly around 40 years old back to his flat on the 10th floor at block 682 CCK Crescent. Electricity at the block was disrupted from 8am to 5.30pm due to a fire. “The first time when I carried the man, I forgot that I was fasting. I sincerely only wanted to help till I forgot that I was actually fasting. However, after one flight of stairs, I remembered that I was fasting. After that, I actually slowed down.” Said Mr Farizzat who has been working at the Town Council for more than 1 year. He took turns with Mr Joseph Lee to carry the man as he had told them that he needed to go home quickly. Their action attracted MPs for Choa Chu Kang GRC Mr Zaqy Mohamad & Mr Alex Yam whom had uploaded the photo of Mr Joseph Lee carrying the resident up the stairs on their Facebooks’ on Wednesday. Their Facebook posts have garnered a lot of social media attention with many people applauding their actions. When Mr Zaqy Mohamad was contacted on Friday evening, Mr Zaqy Mohamad highlighted that he was proud when he heard what these two officers had done. “People are always saying that Singaporeans are self-centered but this has gone to shown that Singaporeans do care about other people. Their actions have shown good customer service which is what we want in our industry.” Said Mr Zaqy Mohamad. Mr Farizzat added, “I didn’t expect my actions to attract so much attention because I only wanted to help and I am really shocked with all the attention. Reported that a man was bitten by a rat at a coffeeshop in Choa Chu Kang while having breakfast due to rat infestation at Teck Whye Shopping Centre and around Choa Chu Kang Ave 4 Blk 485D. A shop owner at Teck Whye Shopping Centre mentioned that there has been rat problem since they started business here 17 years ago. There will be 4 to 5 rats running around in the corridor in the morning and some of them were as big as cats. The rats will also bite through paper boxes and plastic bags. A resident mentioned that a man was bitten on the toe by a rat. He was bleeding and went to a nearby clinic for consultation. One coffeeshop spokesperson mentioned that there’s already improvement in the rat situation for the past 2 to 3 years. A residents from Blk 485D mentioned that the rats were usually seen in the rubbish collection area at the ground floor. They were as big as cats and were rummaging the rubbish for food. Chua Chu Kang Town Council mentioned that rat infestation usually occurs at areas whereby food waste are not disposed properly, such as Teck Whye Market and construction sites. In recent months, the Town Council has already been conducting rat control programmes. Burrow holes were also sealed up. Inspections were stepped up to ensure that the treatment was effective and to monitor the situation. Next, they will be embarking on a structured rat elimination program to better combat the rodent population. A dedicated full-time team will work to reduce the rodent population significantly in the first phase while in the subsequent phase, the team will continue to carry out extermination to achieve and maintain zero signs of rodent activity. The whole programme will last for two years after which they will conduct a survey on the rodent situation and decide on their next step. They will also continue to work with NEA to educate the residents on proper rubbish disposal. A HDB’s electricity supply shutdown for nearly 10 hours, the Town Council mobilized their staff to help the residents. 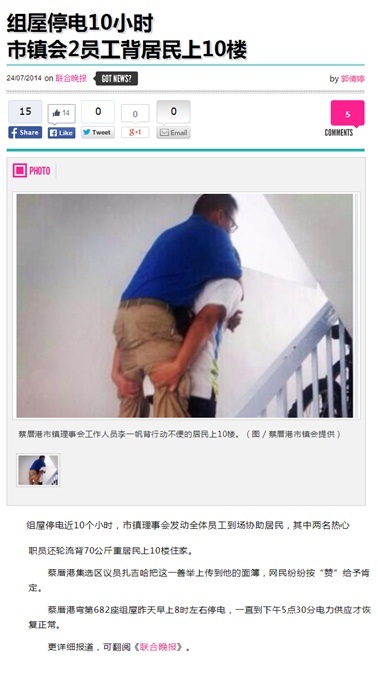 Two Town Council staff even took turns to carry a 70 kg resident up 10 levels to his unit. Chua Chu Kang GRC MP Mr Zaqy Mohamad posted this incident on his facebook and received many likes from the netizens. Choa Chu Kang Blk 682 electricity supply was shut down from 8am till 5.30pm. A spokesperson from Chua Chu Kang Town Council mentioned that time was needed to restore the electricity supply, hence, the General Manager, Deputy General Manager, Property Manager, and Officers went to the site at 8am to help the residents. 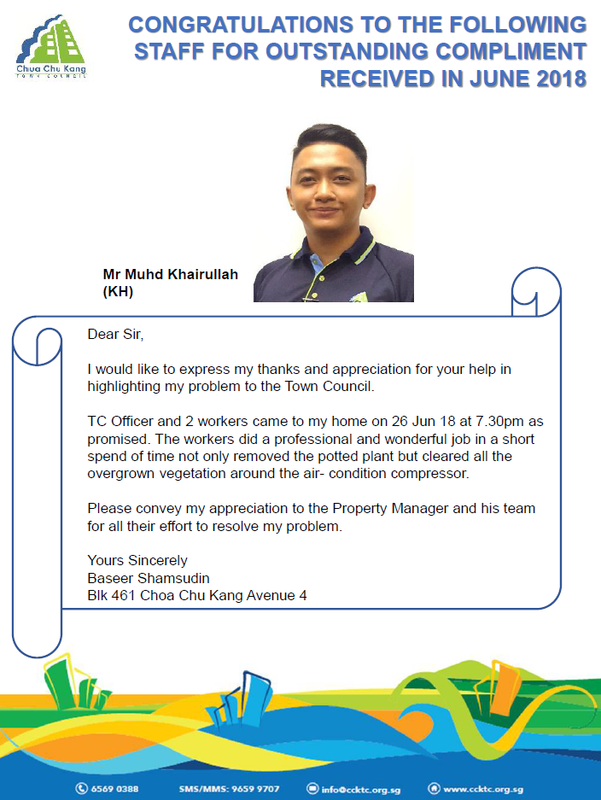 A resident who had difficulties in walking successfully went home to his unit at level 10 with the help of Property Officers, Joseph and Farizzat. Farizzat was fasting during that time, however, he volunteered himself to carry the resident up. Joseph mentioned that the resident was holding a walking stick on one hand and a bag on another hand. Joseph and Farizzat walked him up to level 2, however, the resident was having difficulties to continue walking up. Hence, they took turns to carry the resident up. Farizzat didn’t eat or drink after 4am in the morning, however, this did not deter him from helping the resident. Farizzat mentioned that he carried the resident from level 2 to 5, Joseph from level 5 to 7, and him again from level 7 to 10. The resident is about 40 years old and weighting 70kg. Joseph and Farizzat sent him back home and continued to help other residents. Joseph and Farizzat mentioned that although it was tiring, they are willing to help the residents to minimize any inconvenience due to the electricity shutdown. The act of kindness is beyond their job scope and they have received compliments from the MP and residents. Chua Chu Kang GRC MP Mr Zaqy Mohamad posted this incident on his facebook to compliment Joseph and Farizzat. Mr Zaqy mentioned that he is proud of them and other than this two staff, the General Manager and Deputy Manager also helped out at the site thus, reflecting teamwork in helping the residents. There were over 400 likes on the post up till yesterday afternoon. A HDB’s electricity supply shutdown for nearly 10 hours, the Town Council mobilized their staff to help the residents. Two Town Council staff even took turn to carry a 70 kg resident up 10 levels to his unit. Chua Chu Kang GRC MP Mr Zaqy Mohamad posted this incident on his facebook and received many likes from the netizens. Choa Chu Kang Blk 682 electricity supply shutdown from 8am till 5.30pm. Chua Chu Kang MP Mr Zaqy Mohamad calls for stiffer penalties for mosquito breeding at construction sites following a dengue outbreak at Keat Hong ward due to mosquito breeding at the construction sites. China Jingye Engineering, the main contractor for Sunshine Gardens construction caused the largest dengue cluster in Singapore’s history. Mr Zaqy Mohamad mentioned that the dengue cases have always been low here. However, the construction sites caused a dengue outbreak and contributed to a third of the cases. He hopes that HDB will ban China Jingye Engineering from tendering for HDB projects for at least half a year. HDB mentioned that it has banned China Jingye from tendering for its contracts for three months. The contractor has also paid over $10,000 fines and will be prosecuted. Up till last Tuesday, there were more than 316 dengue cases from a single dengue cluster which caused a record high. 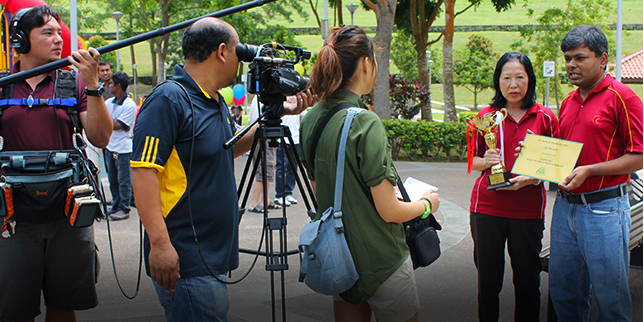 115 cases were from workers at Sunshine Gardens and 6 cases were from workers at Keat Hong Pride. Both construction sites have received stop-work orders. Since March, Jurong Police Division have installed mirrors in lifts at 450 blocks in areas including Bukit Batok, Choa Chu Kang and Jurong West. With the mirrors, those in the lift can monitor the people behind them and watch out for crime. After knowing the true purpose of the mirrors, most of the residents supported this initiative while some residents thinks that it doesn’t help much. MP for Chua Chu Kang GRC, Mr Zaqy Mohamad, mentioned that this is a pilot project by Jurong Police Division. Indeed, most of the residents do not know the true purpose of these mirrors and some may even get scared by their reflections in the mirror. However, after the residents know the true purpose of the mirrors, they feel safer and thinks that it is beneficial for them. Chua Chu Kang has the largest active dengue cluster. The National Environment Agency expects the number of cases to rise further during the ongoing peak dengue season spanning June to October. SINGAPORE: The number of dengue cases in Singapore has crossed the five-figure mark, with 10,112 cases as of 3.30pm on Thursday (July 10). In a statement issued earlier this week, the National Environment Agency (NEA) said there was a “sharp rise” in the number of reported cases of dengue, and warned that it expects the number of cases to rise further during the ongoing peak dengue season. For the week ending July 5, a total of 891 dengue cases were reported, up from the previous week of 674 cases. DENV-1, the strain of virus that caused the 2013 epidemic, remains dominant, accounting for almost 90 per cent of infections, the NEA said. Another 556 cases were reported between July 6 and 10, according to the NEA website. As of Thursday, there have been 28 clusters identified as high-risk areas. A total of 192 cases of dengue have been reported at Chua Chu Kang Avenue 2, 3 and 5 – making it the largest dengue cluster in Singapore currently. One work site there was slapped with a stop-work order after authorities found four mosquito breeding sites there. More than 30 workers fell ill from dengue fever, while 60 residents one street away also caught the disease. MP Zaqy Mohamad said the National Environment Agency found more than 70 mosquito breeding sites across Chua Chu Kang in total – 12 in public areas, and eight in construction sites. “What was interesting was we found 50 breeding sites in homes. In the residential areas that they visited, not every house opened their doors. So it is something that we need to continue educating residents. While there is risk coming from the environment, the majority of breeding sites that were found were in the residential areas,” he said. Work is underway to replace the constituency’s concrete drain covers with metal grating, to minimise the incidence of choked drains that can breed mosquitoes literally under cover. Authorities have also stepped up mosquito control work and inspections in the hotspot. The large population of birds caused trouble for the residents; the birds not only created noise pollution, they also dirtied the air-con ledge area with their waste. To prevent bird nuisance, Chua Chu Kang Town Council installed invisible grills at two HDB blocks. This pilot project started this year and the installation was completed last month. It is believed to be the first large scale invisible grill pilot project in an HDB estate. Town Council mentioned that the number of bird nuisance complaints have dropped drastically after the invisible grills installation, there were less than 5 cases last month. The invisible grills have successfully stop the birds from entering, thus, preventing bird waste at the air-con ledge area. 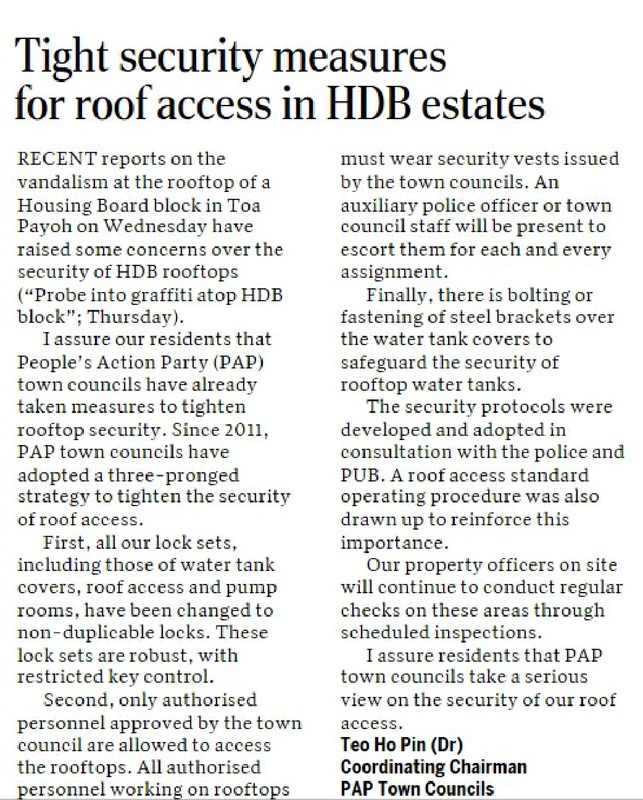 However, residents feedback that the invisible grills seems like prison grills and affects the look of the HDB flat. When their clothes fall off their laundry poles, it will get stuck at level 2 invisible grill structure, thus, making it difficult to retrieve the clothes back. The invisible grills caused many residents curiosity and attention after it was installed. The invisible grills do not prevent high rise littering nor thieves, it prevents bird nuisance. Walking past Choa Chu Kang Ave 5 Blk 484A and 484B, you can see invisible grills have being installed at the exterior of the block. From far, you will not be able to see the grills, as they were made of thin thread-like metal. CCK Town Council mentioned that the pilot project started in January this year and the installation was completed last month. It is believed to be the first large scale invisible grill pilot project in an HDB estate. Yishun Town Council and Pasir Ris Punggol Town Council also faces bird nuisance issues but they did not start any similar pilot project. Pasir Ris Punggol Town Council Chairman mentioned that he is also eager to find out if the invisible grills are useful. A spokesperson for CCK Town Council mentioned that bird nuisance is one of the most common feedback received, hence, they have been actively finding an effective solution to this problem. The spokesperson also mentioned that they have tried to install bird spikes on the air-con ledge to prevent birds but it is expensive and ineffective. Another alternative is bird netting, however, it traps rubbish and gondolas are needed for washing of the netting by the cleaners. This also proves to be ineffective and time-consuming. Hence, after evaluation, the Town Council have decided to embark on this pilot project. Town Council mentioned that the number of bird nuisance complaints have dropped drastically after the invisible grills installation, there were less than 5 cases last month. Some residents also feedback that the invisible grills prevented the birds from entering the air-con ledge area and the area has become much cleaner. Resident Mr/Ms Lim mentioned that there used to be birds flying into the kitchen but this situation has decreased. The Town Council will bear the cost of the installation. Although the cost is not revealed, the cost is similar to the installation of bird spikes. LeGate CEO estimated that the installation of invisible grills at the two blocks will cost more than $50,000. The invisible grills are installed in HDB flats to prevent monkeys, birds, and for the safety of children. Residents feedback that the invisible grills looks like prison grills because they do not understand the purpose of the structure. Hence, they think that the Town Council should improve their communication to the residents. Resident Mr Wong mentioned that it is a big project and expensive just to prevent bird nuisance and he worries about future conservancy charges. He did not know about the function of the invisible grills until much later. He think that the Town Council should have asked for the residents’ opinion before installation. He also mentioned that smaller birds are still able to enter and the level 2 structure is not ideal due to the difficulty of retrieving clothes that fall off. Resident staying at level 2 mentioned that there has been 3 neighbors who wanted to retrieve their clothes in the past 1 month. The Town Council mentioned that they have put up notices at the lift lobby to inform residents about the invisible grills. The next step will be to evaluate the effectiveness of the invisible grills and to promote to other estates if effective. The resident who dumped his trash in a lift at ​block 450 Chua Chu Kang Avenue 4 has been warned by Town Council employees against repeating such an irresponsible act. According to a spokesperson from Chua Chu Kang Town Council, action will be taken if the littering occurs again. The rubbish has also been removed, and the lift has been cleaned. Fellow residents discovered the identity of the culprit after they found a letter bearing his name and address amongst the trash. A warning note addressed to the culprit was subsequently put up in the lift. The swift action by the Town Council in responding to the matter demonstrates the effectiveness of Stomp in getting things done. We would like to inform our residents that the litter in the lift of block 450 Choa Chu Kang Avenue 4 has been removed and the lift has been cleaned. We have also met with the resident involved in this incident and have warned him against committing such an irresponsible act again. Action will be taken if the littering reoccurs. We continue to seek the co-operation of our residents to properly dispose rubbish into the central rubbish chute, and to play an active role in keeping the estate clean so as to create a safe and pleasant living environment for all. Rubbish left on the floor or improperly disposed invites pests that carry many kinds of diseases. We thank Stomper Xxxllamaxxx for their feedback.